This is a very beautiful location, another one of Phuket’s scenic viewpoints offering a great panoramic view from on high. 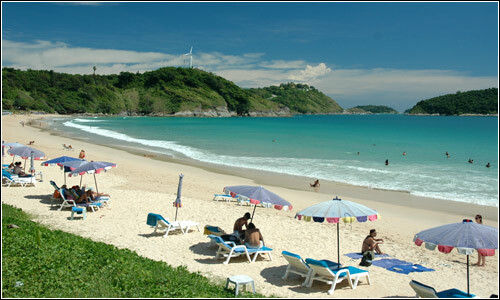 Not only do you have a great view of the beautiful Nui beach, but also, the very popular and charming Nai Harn beach. These beaches have beautiful white sand, and in the tourist season, you can see many elegant yachts moored in the clear, crisp turquoise sea. If you enjoy fishing, you can take a shortcut to the rocks below by following the path through the grass, or if you want to take even more scenic photos, you can stop along the path for a unique photo opportunity through the golden grass. 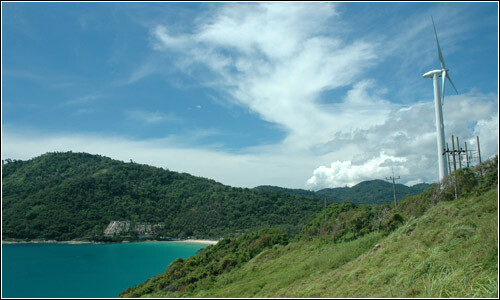 Getting to the Windmill Viewpoint is as easy as following the island road from Nai Harn Beach, or Promthep Cape. The roads are windy and steep, but in good condition. Be careful to steer, and not be distracted by the beautiful views! THAILANDNai Harn beach is not a long beach, but it has beautiful clear water, white sand, pine trees along the edge of the beach, creating a great atmosphere to relax in. It is public land, so there hasn’t been the rapid development of hotels like at other beaches. This beach is popular with foreigners and locals who are looking for a place to relax, and swim. Care should be taken during the monsoon sea, as the waves can become large and it can be dangerous for swimmers.Close to the beach is a reservoir with a small island and a connecting bridge. The island is shaded by pine trees, making it a cool place to relax, and there is even a playground for children to play. At the end of the beach is the hotel Le Meridian Yacht Club, and if you drive through and follow the road, you will come to Sane Bay. In Sane Bay is quite and isolated, and there is a single small resort that is not well known, by tourists and residents of Phuket alike. 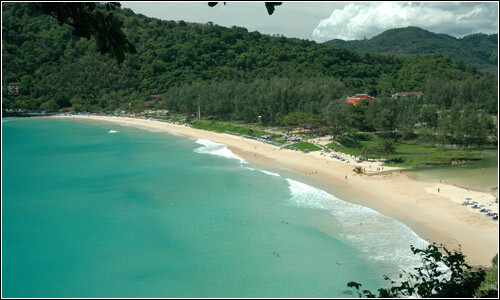 The road runs along the base of a hill from which you have a clear view of Nai Harn Beach and the Windmill Viewpoint. Sane Bay is more rocky than most beaches in Phuket, and you may see locals fishing for fish and squid. It is only fews kilometers from the hotel, and the beach is small with lots of rocks, which makes it a nice place for a quiet swim, and the shallow water and coral reef make it popular with skin divers. Close to the hotel, Sane Bay offers a very close alternative to the usual beach buzz, with a quiet and calm atmosphere giving those who visit the chance for real rest and relaxation. Getting to Nai Harn Beach is simply a case of following the coastal road from Promthep Cape, or use the shortcut from Rawai Beach, and it is only 18km from Phuket Town.